The author, a former ambassador, is vice-chairman and executive head of the Kerala State Higher Education Council. By naming Prime Minister Narendra Modi’s vision of India-US relations laid out in his speech to the joint session of the US Congress as the “Modi Doctrine”, Assistant Secretary of State for South Asia Nisha Biswal acknowledged Modi’s willingness to go all out to become an ally of the US, but attributed the ideas outlined in the address to a doctrine of his own. She hinted that the US had an open mind on it, but was not committed to it. As a stated principle of government policy, Modi’s speech to the Congress can be characterised as a doctrine, but a doctrine should encompass a global vision covering other countries and regions of the world. With regard to the US, however, it was more of a plan of action than a doctrine. It is also not the style of Modi to be doctrinaire in his approach to foreign policy. He has proved himself to be a pragmatist. If he was doctrinaire in his approach, many of the proposals could not have been made at all as many were opposed by the BJP, including the desire to be an ally of the US. The nuclear deal and related issues have come full circle for Modi. He was part of the Vajpayee government’s efforts to get the US to come to terms with the Indian nuclear tests, when Jaswant Singh was engaged in a conversation with Strobe Talbott, which eventually led to the nuclear deal. Then the BJP opposed the nuclear deal as contrary to Indian interests and shaped the liability law, which stood in the way of nuclear trade with the US. Modi, as PM, is hard at work to negate the liability law to set up six Westinghouse reactors in India. Nothing is heard of the liability law and no one knows how the people of Andhra Pradesh will react to a virtual nuclear park in their state. Pragmatism, rather than a nuclear doctrine, drives Modi. Being designated as a “defence partner” and gaining access to technology like “the closest allies and partners” is a mere extension of the defence collaboration agreement signed in 2005 by the then Defence Minister Pranab Mukherjee. Stymied by A.K. Antony’s reluctance to make purchases and the American insistence on agreements on sharing information, defence cooperation was going slow, but Modi has revived it as part of the ‘Make in India’ plan to remove the stigma of being the largest importer of weapons in the world. The renewable energy programme forged with the US is not new either. Side by side with the nuclear deal, emphasis was given to the development of renewable energy to reduce the consumption of fossil fuels. Similarly, increasing bilateral trade has been a part of the relationship for many years and it will remain a priority. Every PM has sought remarkable increase in trade and the US has also been keen on setting high figures for bilateral trade. When Modi spoke about overcoming the hesitation of the past, it is clear that he was not announcing a new policy of friendship with the US. India had always been keen on good relations with the US and it was the US which had declared nonalignment immoral and branded India as pro-Soviet. It was the US which hyphenated India and Pakistan and allied itself with the military in Pakistan without giving India credit for its democracy. Successive prime ministers have attached importance to improving ties with the US. After the end of the Cold War, India readjusted its foreign policy to accommodate the US as a friend. P.V. Narasimha Rao thought he had resolved the nuclear imbroglio and opened a new chapter in relations. Manmohan Singh risked the very survival of his government to sign the nuclear deal. The hesitations of the past were more on the US side than on the Indian side. So Modi has merely taken an established policy forward beyond the previous government’s position by leaning towards the US in the Asia-Pacific because of the dictates of security. In other words, there is no new doctrine here. 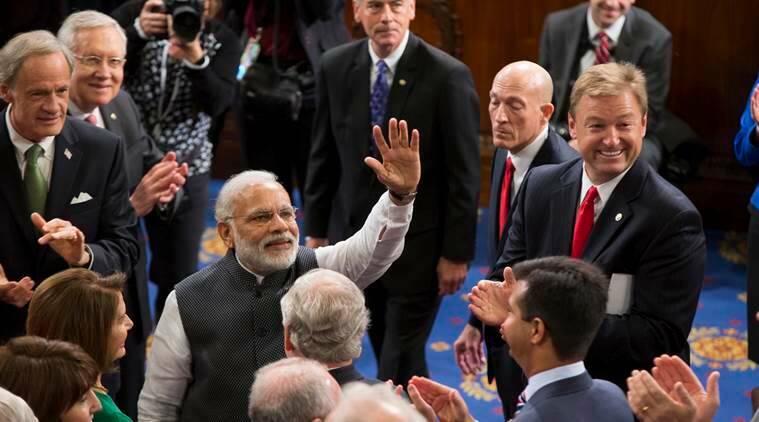 In fact, Modi’s address to the joint session of the US Congress was not substantially different from those of his predecessors. All of them spoke about the strong cultural ties, democratic values and historic links, and common elements in the constitutions of the two countries, even though none of these came into play in the bilateral relations during the Cold War. They spoke of the cooperation that existed from the time of Indian independence in education, science and trade. They spoke about the presence of a large number of Indians in the US, who had contributed to the US and made India proud. They also did not hesitate to mention differing perspectives of the two countries on certain issues. The difference this time was the transformation of India from a friend to an ally, which wishes to transfer many eggs from other baskets to the American one without worrying too much about strategic autonomy. Indira Gandhi did much the same in 1971 with regard to the Soviet Union. Deepening worry about China is driving India into an American embrace, but not without fear that the embrace might turn out to be like the famed embrace of Bhima by Dhritarashtra. But the Indian public appears to have taken the move in its stride. Modi claims that there is a new symphony being played. But the symphony is not new, it is a new orchestra playing the old symphony more loudly and clearly. The US sees it as a new doctrine, yet to be understood and absorbed by it. In actual fact, wanting to be friendly with the US has been in the Indian security doctrine right from the end of the Cold War. What is new is the American willingness to tango with India, as stated by Ashton B. Carter: “There is important business with respect to Pakistan, but we have, much more, a whole global agenda with India, agenda that covers all kinds of issues.” The New York Times has stated that “India has displaced Pakistan in American interests and hearts.” But the mention of Pakistan in both the statements is ominous. India-US relations are bound to remain like a roller coaster ride, but they are certainly on the upward trajectory after Modi’s voyage.